Need New Head...where's Best Place To Buy??? 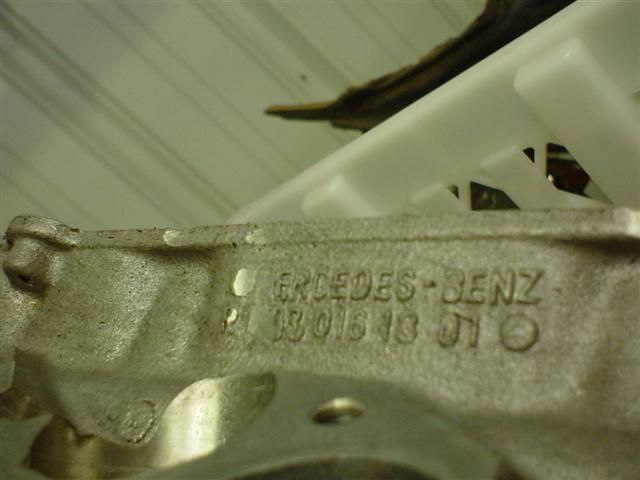 I have attached a pic of the stamped numbers, not sure why or how the 6 of 603 and M of Mercedes got damaged. Maybe I have uncovered yet another head #. Last edited by 300sdlguy; 12-28-2004 at 02:18 PM. Yup, that look's like a #18! You would only need to concern yourself with milling PC's if the head did not come with them already installed. Only when buying a brand new head do you need to install PC's, (they dont come with them) and only if you were reusing the PC's out of your old head, as the newest 22 heads have a taper on the ends of the PC's. Also, I hope you are already aware that when the cam go's back on, that there is a critical sequence in the way in which you bolt it back on! Last edited by BusyBenz; 12-28-2004 at 04:07 PM. I am assuming I will have to use my old prechambers from my 1987 as this head is from a 1991. Didnt know about the special sequence, but will research it for sure. Should it be in the factory manual that I have on CD? Yep, that's an -18. It looks very similar to a -17 and -20, as it still has the open cavity between #1 and the chain case. Why do you need to use your 87 PC's in this 91 head? The tappered PC's are only needed for the #22 heads, not for the #18, I thought? Are you reusing the 87 cam, or does the 91 head come with it's own cam? Last edited by BusyBenz; 12-28-2004 at 06:40 PM. I recently bought a new head (-22 series) from Metric Motors. Talk to Mike. I decided to replace all components (valves, springs, guides, lifters, cam, prechambers, glow plugs, injectors, head bolts, and timing chain tensioner). The toal cost was $3600 for everything. It came ready to bolt on. I've put about 1000 miles on it and so far so good. I had no problems with Metric Motors. They are very knowledgeable. Yes the head comes as pictured. I guess I misunderstood and thought the pch's on 90 & 91 heads would not fit with the injectors from an 87, and would need to be milled as the injectors were at an angle and the are not on the 87 head. Am I wrong, that would be awesome if I could just have it bolted up without any other machine work. A better explanation can be offered on the pages of the link below. Go to this thread. It will explain more specific info about PC exchange. Last edited by BusyBenz; 12-29-2004 at 03:03 AM. If you do go to the newer injector setup, be very careful with the injector lines. They used my old injector lines, but managed to break one right at the IP while manipulating them to fit the inclined injectors. Well, I should say they didn't break it, but stressed it enough apparently that it broke within 300 miles after having the head put on. Hmmm....in 4 years of following 603 head related threads, I've never heard of an -18 head, but this could be the first. Your looking for a head, but here is an old thread worth checking out. GSXR has some good post here. Nothing to do with an #18 head though. The new head arrived yesterday, and it is indeed a #18. Now I need to see if the prechambers will fit or if they need to be machined or exchanged with mine from the old #14 head. All the prechambers fit all versions of the head (14 through 22). Sometimes the old (vertical) prechambers need a little tweaking to seat properly, but that's all. I had to do this to make them fit in my #22 head. New vertical prechambers would need the SAME modification. Converting to the inclined/angled injection is extremely expensive unless you bought a used head that came with free angled prechambers, lock rings, injectors, AND glow plugs. On a side note, Adsito does not have a stellar reputation for their business practices. I recall something about their return policy - even if THEY made the error (sent wrong item, etc), YOU had to pay for return shipping costs, etc. Search the forum for some horror stories. I'm amazed they're still in business. 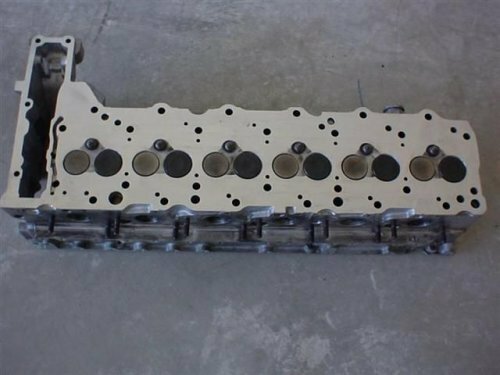 For a new head, also call Caliber Motors or Rusty (800-741-5252), a new bare #22 head should be about $1500 plus shipping. Used #17+ heads are quite scarce and typically go for $800-$1200. 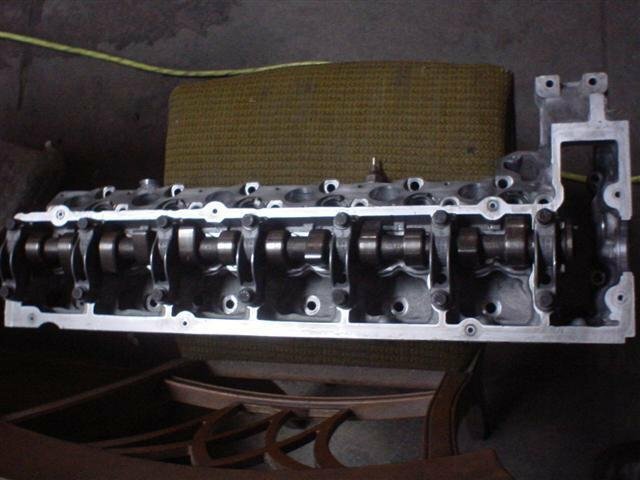 The #22 head is the ONLY one with the modified oil passage in front of the #1 cylinder. Today I sent ALL 6 of my injectors in to get rebuilt (or replaced with rebuilt ones), and sent the valve cover to get sand blasted and powder coated bright alluminum in color. I think I am going to have the exhuast manifold's jet coated too. Hopefully it will look good. I just sent my exhaust manifold, and trap replacement pipe (with the foil torn off), to Jet-Hot to get coated with their 'Sterling' treatment inside & out. I'm also going to get Thermo-Tec's turbo wrap kit, wrap the turbine, and also wram the downpipe to the catalyst. I suspect this will reduce underhood heat significantly - and it should look pretty slick too! Also, and off THIS topic, I need to talk to you about the stereo setup in my 300SDL, when I purchased it years ago it had a custom Rockford Fosgate system, including custom rear shelf (very high-end Los Angeles stereo shop) that looks awesome, but its the older systems, and I want to update a bit.